As the debate on whether or not to do away with printed media guides for NCAA football and basketball goes on, the football and basketball writers have chimed in. The Football Writers Association of America (FWAA) and the U.S. Basketball Writers Association (USBWA) has issued a joint statement which supports the Southeastern Conference proposal to retain printed "media only" guides, with a ban on giving the guides to recruits, parents, and coaches. Football Writers Association of America (FWAA) and the U.S.
right to publish printed media guides for football and basketball. Image Copyright 2009 by Eye on Sports Media/The Cayuga Group, LLC. Here is their statement, followed by a survey of what each NCAA Division I conference plans for the 2009-2010 year. 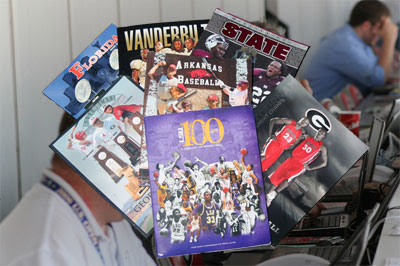 The U.S. Basketball Writers Association (USBWA) and the Football Writers Association of America (FWAA) support the proposal by the Southeastern Conference which would preserve 208-page printed media guides for football and basketball and eliminate recruiting material and the guides being given to recruits, their parents or coaches. The two organizations believe there still is a strong need for printed guides in football and basketball after polling membership. The main reasons cited by members were the difficulty of accessing needed information on-line and the inconsistencies with which it is presented by schools, even within the same conference. There also is a fear of Internet failures at events - such as last spring's Final Four in Detroit - which prevent the access of needed information. Besides support for the SEC proposal, the two organizations also make several other observations regarding the media guide issue, knowing that the SEC proposal merely offers schools the opportunity to continue to print guides in those sports and allows recruiting information to be e-mailed to recruits. Several schools and conferences already have decided to cease printing media guides before legislation to do away with them has even been passed. · Media guides/areas should be just that. If the SEC proposal is adopted, this would occur in printed media guides, but still leaves open the possibility on-line media areas will be compromised with recruiting and fan information and solicitations (tickets, t-shirts, novelties etc.) On-line media areas also should be devoid of solicitations and interactive content which prolong quick access to information. · Conferences and schools should make their web sites easier to navigate. We urge individual conferences to adopt standards and consistency in regards to style and presentation. · All major football and basketball conferences should look at the suggested elements for media information which have been provided by the FWAA and USBWA, either for printed media guides or their electronic/digital versions.